As part of KLM’s fleet renewal program, its first Boeing 787-9 touched down at it’s home base Amsterdam Schiphol in The Netherlands on November 14, 2015. Just a week later, on Sunday 22, we were able to fly the first ever passenger flight. 21 Dreamliners -9 and -10 will join the KLM in the coming years. 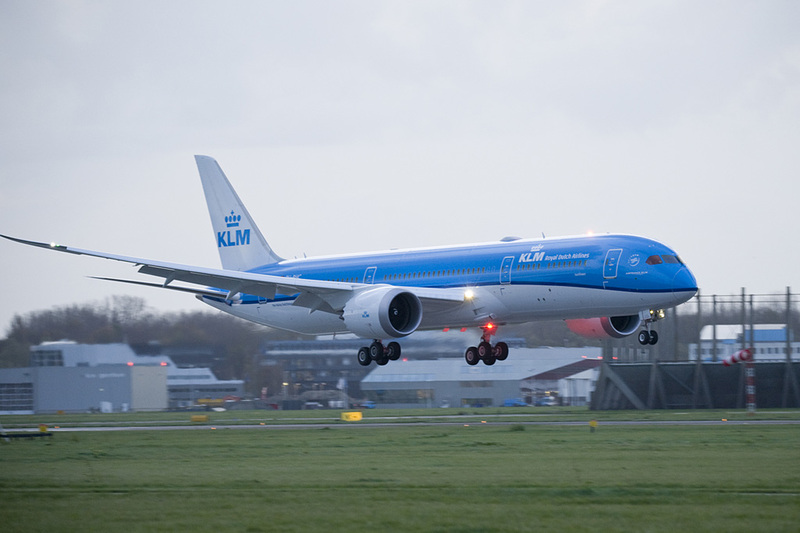 In the early morning of Saturday November 14, KLM Dreamliner named Sunflower touched down on runway 27 at Amsterdam Schiphol, after a direct flight from Paine Field, Everett. Although it was 8 am, lots of aircraft enthusiasts gathered to witness this event. Sunflower PH-BHC was the first to arrive, although PH-BHA took first flight at Boeing on October 14. Due to the a delayed C1 flight of the A airframe, C was delivered first. On Sunday November 22, we joined the first ever passenger flight out of Amsterdam. This special inaugural flight, and two others later that day, were organized by KLM to let enthusiasts experience the new aircraft. Like the special farewell flights of the MD-11 a year back, the program was more or less the same. We gathered at 7am for check-in and headed for concourse C after clearing security. Around 8 we were driven by bus to cargo platform R, where the Sunflower was waiting together with KLM (DDA) Dakota PH-PBA. At 9:32 we were cleared for take-off from runway 36L, directly banking left to avoid the heavy hailstorms north of Schiphol. The weather was that of a typically Dutch autumn day, with heavy rain/hail cloud formations and sunny open spots. The pilots tried carefully to maneuver through the open spots. Due to this weather, our journey took us south, via harbor city Rotterdam, over Zeeland. Zeeland is the westernmost province of the Netherlands consists of a number of islands and peninsulas. Our planned route towards Utrecht in the center of the country was changed due to the weather so we turned over the coastal town of Vlissingen and headed back towards Rotterdam, passing ‘Oosterschelde’ waterworks and ‘de Maasvlakte’, newly created harbor area west of Rotterdam. During the flight we stayed at 2000 feet (610meters) which resulted in a bumpy ride and some concerned telephone calls to the police in Zeeland. It’s not common to see a large plane flying so low in this part of the country. 58 minutes after departure we touched down again at Schiphol on runway 06. The cabin is very light and the large windows of the 787 stand out immediately. As one would expect KLM choose a white-blue scheme for the cabin. It configured the Dreamliner -9 in a 294 seats three-class layout. 30 lie-flat seats in world business class are arranged in a 1-2-1 setup. Seats are placed in an angle facing out, giving a very spacious feel to in. The seats have a 16-inch screen installed with KLMs new entertainment system. There is also a touchscreen controller for chatting or playing games. Economy Comfort and Economy are arranged in a 3-3-3 setup. 48 seats in Economy Comfort with 35 inched of legroom and 216 seats in Economy. All seats are fitted with a 11-inch touch screen entertainment system, USB connector and power socket. The aircraft is also fitted with Wi-Fi which was not activated during this short flight. Another great feature is the LED- mood lightning, which was demonstrated during the flight. White and blue was demonstrated but also Orange, which is the Netherlands national color. The Dreamliner is a great addition to the fleet which will help KLM to compete with airlines like Emirates which renew their fleet at a rapid pace. Monday November 23 the Dreamliner started her normal service on the Amsterdam - Abu Dhabi-Bahrain route. Later on the Dreamliner will also be used on the Cairo service.